In 2005, a girlfriend and I went to a "Mindfulness" day offered through a local Buddhist group. Neither of us are Buddhists, although we probably practice the principles of Buddhism "unmindfully". She is a jin shin jyutsu certified practitioner, and I am certified Reiki master, so we our energies give us a good friendship. We didn't know what to expect from the Mindfullness day, and went with the packed lunch they requested we bring, and an open mind. We didn't know what to expect from Buddhism and Buddhist people either, but the feeling of being there was very comfortable and felt natural to us. The leader explained the schedule of the day, and then told us that to really practice mindfulness, we needed to not speak throughout the day. My friend and I smiled at each other, and were two of the few who could actually not speak all day, even during lunch. Our first exercise was a short meditation. We both meditate, so fell into meditation easily. Then "mindfulness walking" was explained to us, and we took a 40 minute mindful walk. That was life changing for me. It felt like being in a meditative state. I am an almost daily walker, and adding the mindfullness to walking enhanced the experience. There were several meditation sessions, some chanting, and another longer mindful walk. When I go to a workshop to learn something new, I try to take away one thing I can add to my daily life not as an "exercise" but as a part of my life. Now I realize that's a mindfull practice. My daily walk since then has helped me look forward to walking, even on those days when I don't really feel like it. Once I start, I am glad I did. I live in a community, so of course I run into other walkers, neighbors, people walking their dogs, and stop to talk with them. This is also part of mindfulness, being in the moment with what's around you. When I finish my walk, which is usually 20-45 minutes, whatever feels right, I sit. I walk at sunset, so sitting outside in the twilight gives me time to make the transition back to everyday life. It also brings out ideas, creativity, and helps me focus on what's important. When you go to workshops, like yoga, exercise class, dancing, there's so much to learn it can feel overwhelming. Yoga class is usually an hour, and then when you get home, you feel like if you don't have an hour to practice the yoga, then maybe "tomorrow". Mindfullness helps deal with that. For example, my yoga practice is never an hour of just doing yoga. My yoga practice is perhaps 20 minutes. But during the day, like when I'm waiting for the washer to finish the spin cycle, I do tree pose. That's yoga practice. And that's how you can fit in the practices you want to incorporate into your every day life. Mindfulness is actually meditation. 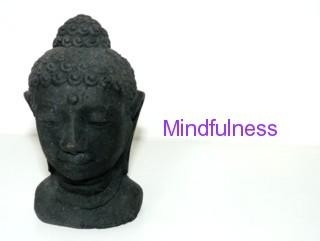 Research is finding that mindfullness practice is helpful and healing to many health problems. Today I read an article about how mindfulness meditation helps migraine headache suffers. The quietness helps balance the nervous system. How mindfulness can be used as a treatment for illness will be topics for future articles here on Calm Spirit. So how do you get started with "mindfulness"? You can attend a workshop. Or you can just "do" it. Find a quiet and comfortable place to sit, good posture. Close your eyes. Realize that thoughts come and go. Let the thoughts come and go and don't let one thought stay in your mind. You can start with doing this practice for one minute, or five minutes, and then increase the time to what you are comfortable with. During the day, when you feel distressed about something, just stop, close your eyes and "be". That's mindfulness. When you are enjoying a very pleasant experience, close your eyes and "be present" for a few moments. That's mindfullness. Eventually, mindfullness will become a part of your life, not just a practice you formally "do". It becomes who you are.